In this article I am trying to share a piece of code that might be useful to some of the developers. Repeat the above process until all urls are fetched. Taking the website http://valuestocks.in (A Stock Market Site) as example I would like to get all the urls inside the website recursively. The main class is SpiderLogic which contains all necessary methods and properties. 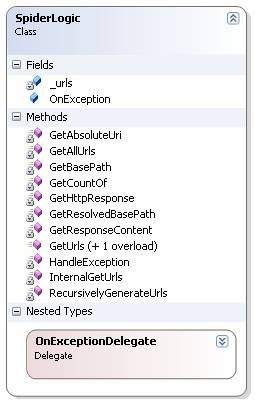 The GetUrls() method is used to parse the website and return the urls. There are two overloads for this method. The first one takes 2 arguments. The url and and a Boolean indicating if recursive parsing is needed or not. The second one is 3 arguments, url, base url and recursive Boolean. This method is intended for usage like the url is a sub level of the base url. And the web page contains relative paths. So in order to construct the valid absolute urls, the second argument is necessary. Another method of interest would be InternalGetUrls() which fetches the content of url, parses the urls inside it and constructs the absolute urls. There is an OnException delegate that can be used to get the exceptions occurring while parsing. A tester windows application is included with the source code of the article. You can try executing it. The form accepts a base url as the input and clicking the Go button it parses the content of url and extracts all urls in it. If you need a recursive parsing please check the Is Recursive check box. In the next part of the article, I would like to create a url verifier website that verifies all the urls in a website. I agree after doing a search we can find free providers like that. My aim is to learn & develop a custom code that could be extensible and reusable across multiple projects by community. The associated source code can be found in c-sharpcorner. Please search using the same title there. What is Foreground thread? / What is Background thread? Threading is a concept we all knows and most of us would have been implemented it in the real world applications. I would like to inform about one more inner level detail on threads – that is Foreground and Background threads. Foreground threads are threads which will continue to run until the last foreground thread is terminated. In another way, the application is closed when all the foreground threads are stopped. So the application won’t wait until the background threads are completed, but it will wait until all the foreground threads are terminated. By default, the threads are foreground threads. So when we create a thread the default value of IsBackground property would be false. Background threads are threads which will get terminated when all foreground threads are closed. The application won’t wait for them to be completed. The application contains 2 buttons, on click of each it will create a thread. Each thread will be executing a method which takes 25 seconds to execute through a mere Thread.Sleep() invoke. The first one will be Background thread and second would be Foreground. After clicking each button, you can try closing the application. From the windows task manager we can see the application would not be listed in the case of Background thread created. 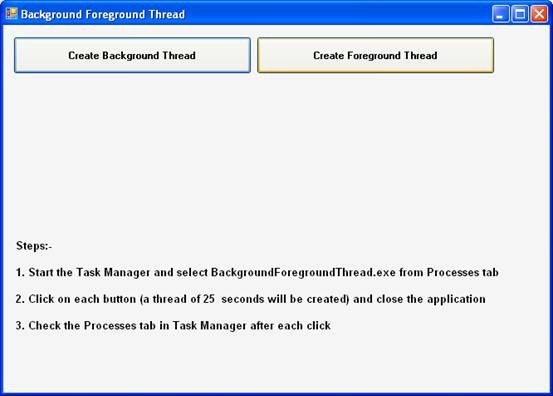 From the windows task manager we can see the application would be still running in the case of Foreground thread created. 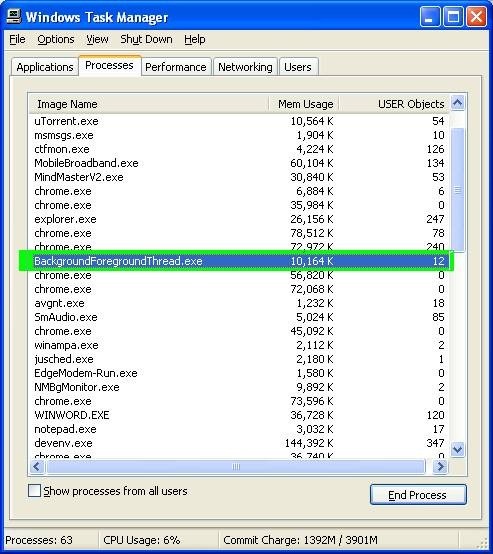 The following image shows the snapshot of task manager just after closing the application after invoking a foreground thread. The application will continue to run until all the foreground threads are completed. We can specify foreground threads for business critical tasks. Meantime, the background threads can be useful for polling services or logging services which could be discontinued once the application is closed. The lock keyword in C# provides good control over a multi-threaded application. But if we are using it in an unwanted scenario it could impact performance. Sometimes, the usage of threading itself would not be benefited. I am trying to explain a valid scenario where lock is advised in a multi-threaded application. In a multithreaded environment, if a particular method is writing to a file, it is advisable to use lock – otherwise exception will occur. Suppose in a method which is relying on a network resource like copying a file over a network or downloading a file from internet. In this case the lock would degrade the performance as all the threads will be waiting to enter the critical section. If we use lock in the above scenario we will not be gaining from the threading advantage. If we implement lock to the above method it will degrade the performance. A test application is provided to check the performance in both the above scenarios. The application contains buttons which are self explanatory. The first row of buttons deals with the file issue and it is solved by implementing the lock keyword. The second row of buttons deal with the network resource issue where lock is implemented and performance was degraded. On clicking the buttons we can see the time difference it is taking to perform the actions. In the test machine it took 10 seconds for the first one and 25 seconds for the second. 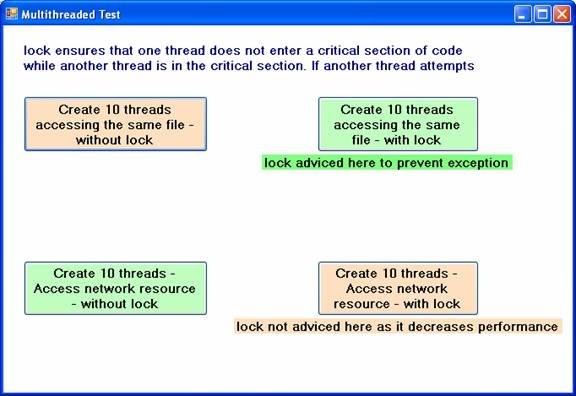 This shows that if lock is not wisely used it could impact the performance in a multi threaded application. The source for the above application is attached with the article. How to find the configuration path of the exe in .Net? How to avoid security error in ASP.NET textbox while inputting html content? The ASP.NET handler checks for security threats on page submissions. This is part of the security checks, otherwise malicious scripts could be injected to the server. But, in some alternative cases we need to bypass this – say we need to save a webpage into the database. But the page validation throws the error. 1. 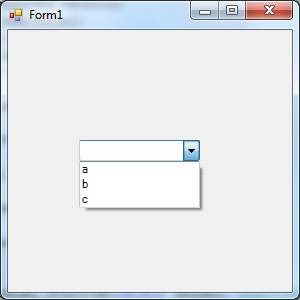 Create a web application and place a textbox and button on it. A potentially dangerous Request.Form value was detected from the client (TextBox1=”<html>test</html>”). Exception Details: System.Web.HttpRequestValidationException: A potentially dangerous Request.Form value was detected from the client (TextBox1=”<html>Test Content</html>”). Now try rerunning the application and click the button. The error is disappeared now. 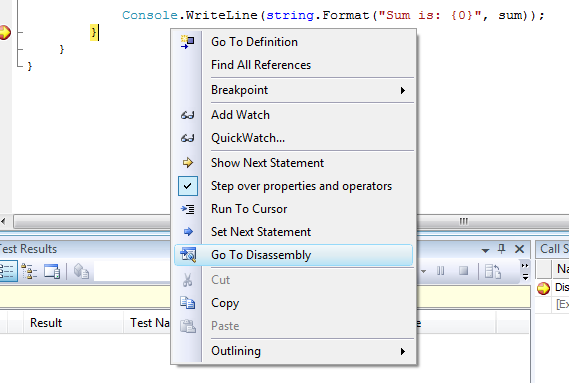 How to view disassembly code in VS 2005/2008? I found that some of the community members are relying on third party tools to view the disassembly generated for .Net applications. It would be nice to see that already this feature is supported by Visual Studio 2005/2008. In the following application I am trying to show the disassembly generated. Create a new console application and replace the main method with the following code. It is depicted in the image below. How to send Html Email using c#?